Who Will You Be? What Will You Know? Refining who you are relates significantly to what you know. 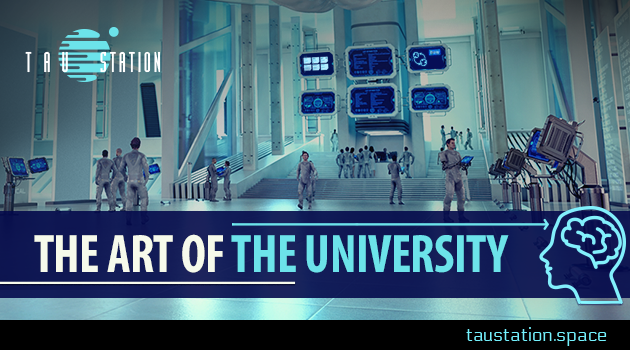 Through the University system of the Tau Station universe, specialization and expertise are not only possible, but also necessary in many cases. 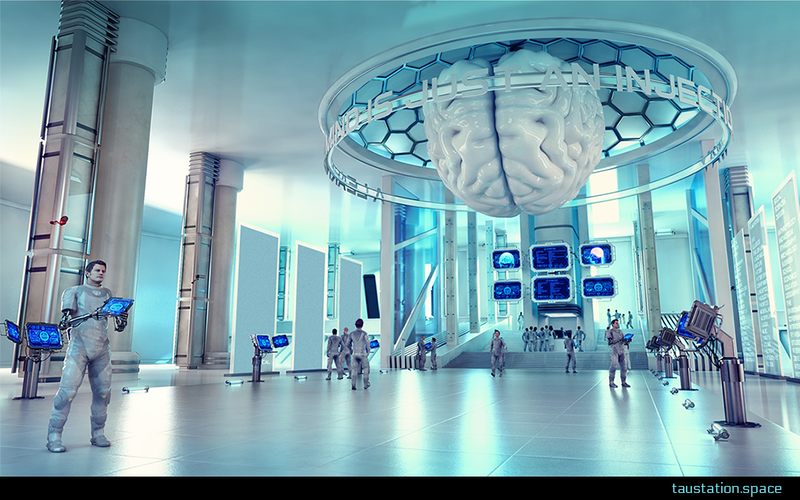 Dedicated computational nanites build the knowledge directly in your brain and at the end of the build process, they connect this knowledge to the rest of your body. Your new knowledge suddenly appears at the end of this process, as quickly as flipping a light switch. Be aware, though, these information injections aren’t available just anywhere: you’ll need to travel to an affiliated University to get the education you’re after. 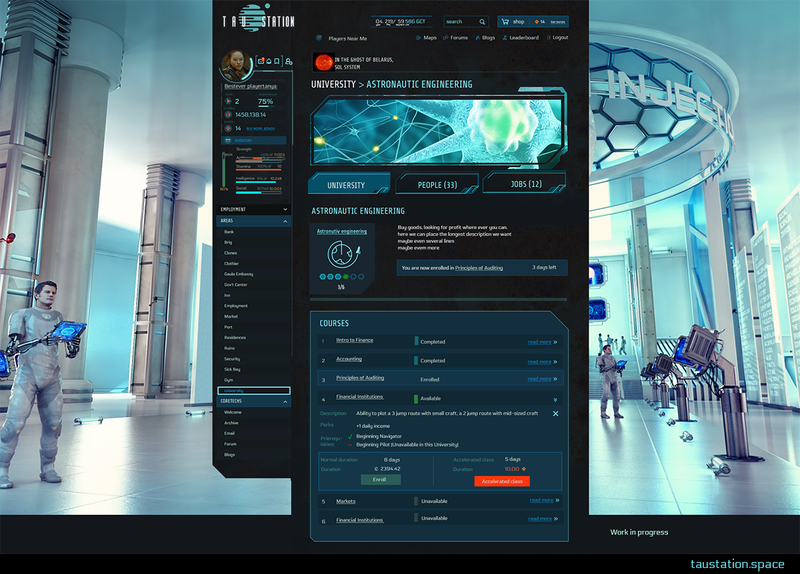 Degrees are offered within seven disciplines: Business, Combat, Engineering, Leadership, Medicine, Psychology, and Spaceship Operations. Some fields of study may only be registered for and completed after prerequisites are met. Each degree program offers a unique boost to the personalization of the individual. The Business degree path may appeal to aspiring merchants, as it branches into three specializations: Bureaucracy, Trade, and Logistics. If Combat is of interest, expertise can be achieved in the fields of Combat Basics, Intermediate Combat, Advanced Combat, Special Ops, and Defensive Tactics. Engineering supplies an education in Basic Engineering, Ship Engineering, Advanced Ship Engineering, and Electronics and provides an understanding of the practical application of structural physical principles and practices. Matters of politics, law, and Syndicate foundation are offered for mastery through the Leadership degree program. 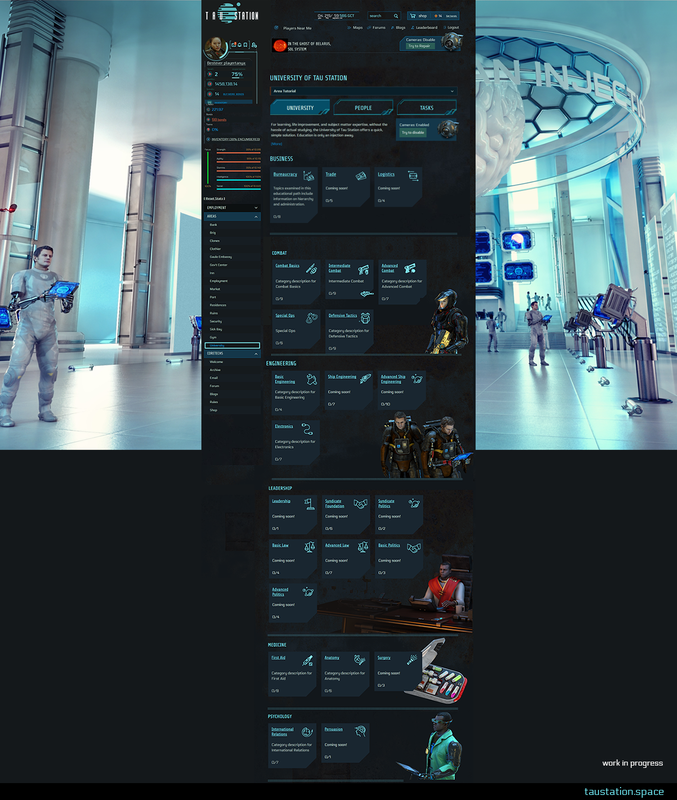 Currently, there are the total of 7 specializations, but it also important of how courses a skill consists. Basic law (Leadership) contains 4 courses while Advanced Ship Engineering (Engineering) has 10 courses you can learn to become an expert. Those of a healing persuasion may serve the common good with instruction on First Aid, Anatomy, and Surgery through the Medicine degree path. Likewise, in the humanities, the Psychology program offers students instruction on International Relations and Persuasion. The popular Spaceship Operations degree boasts an intensive study which includes the course loads of Space Navigation, Ship Technology, Ship Handling, Passenger Handling, Cargo Handling, Combat Ships, Space Mining, and Ship Sickbay. 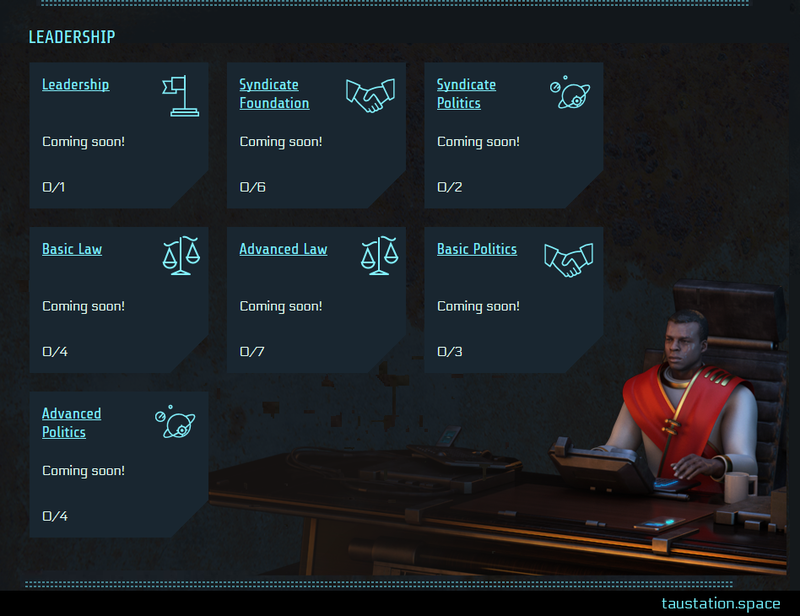 The work in progress UI shown below indicates an important aspect: If you want to enroll in courses, you need to meet several preconditions. Very often you need to pass the previous course in order to start the next one, but there are also recommendations like your character’s level. Clicking on your screen name opens a very useful screen, summarizing a lot of aspects. 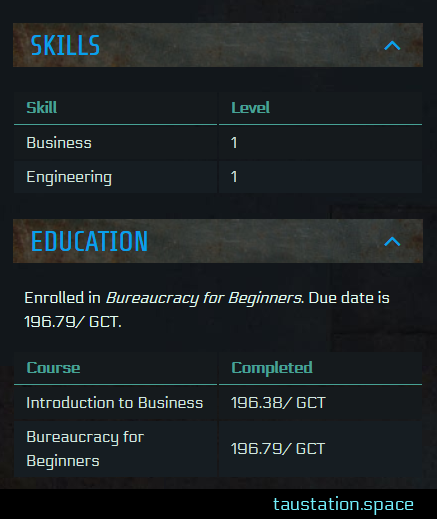 If you want to know which courses you passed or how long it takes until you will finish the current lessons in order to enroll to the next one, this shortcut might be your first choice: Check out your Skills and Educations. 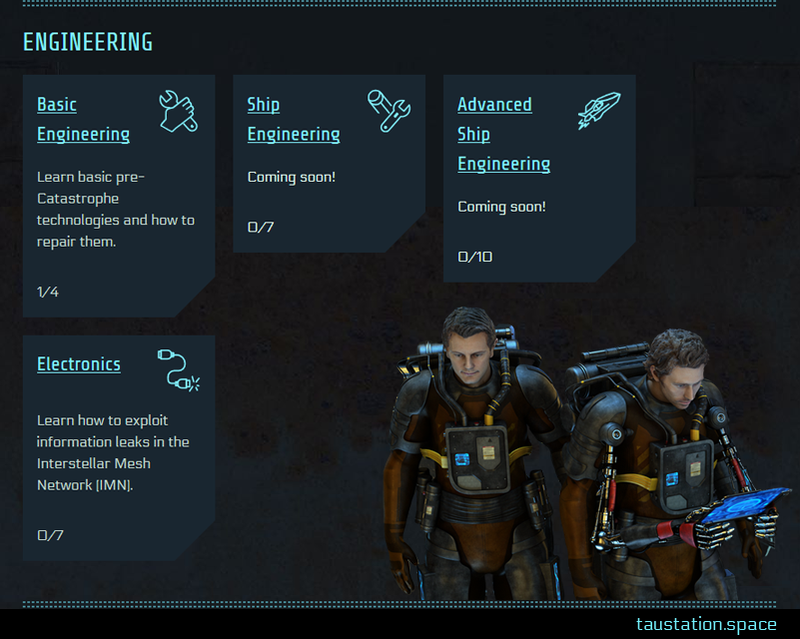 No matter the area of interest, the University system of Tau Station has something for everyone. So long as the credits are good, the knowledge is yours. After all, mastery and proficiency are only an injection away. Would you like to know more?